Your business runs on two things: work orders and QuickBooks. So shouldn’t they work together? Smart Service work order software uses customer and equipment information on QuickBooks to create work orders quickly and easily. Instead of writing the same information you’ve written down a million times before, use Smart Service to create the work order quickly and send your technicians on their way! Right off the bat, Smart Service works with QuickBooks to provide you easy scheduling and dispatching. As an add-on to QuickBooks, Smart Service can use the customer and equipment information you already have. There’s no double entering data for you! Cutting down on wasted time from the get-go allows you to schedule jobs faster and process work orders in no time at all. When you create a job on Smart Service, it pulls information from QuickBooks to make a work order for your technicians. This work order can then be turned into an invoice when you are done with the job! It’s the simple work order software solution for you! Dispatching can be a very problematic area when running your business. When trying to bridge the communications gap between your techs, office staff, and customers, it can be very costly as well. However, as a work order business, it’s not like you can avoid dispatching. With the Smart Service mobile app, all these issues are solved! 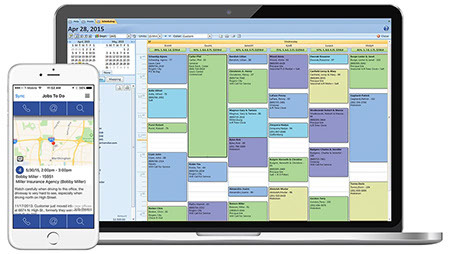 Office dispatchers can schedule jobs easily by viewing the technicians’ schedules and job status. So if one of your techs is almost done with one job, you know they have time for one after! You can also track technician location, create optimized routes, and do more that will help your work order business run smoothly. With iFleet, the Smart Service mobile app, your technicians have a direct line to Smart Service. When they’re on their way to the job, they can use the Smart Service mobile app’s GPS capabilities to optimize the best route. From the office, you can track your technicians’ locations as well! Logging time can also be done with the push of a button. Time tracking information gets incorporated into the invoice on QuickBooks. Want to learn how how you can optimize your business functions? Request a free demo of Smart Service today! Check out some of our field service business tips and tricks!